Anyway on to business If you haven’t heard Lush are launching some awesome new scents some of which i know you’re going to absolutely love! The only down side is that they are only avaliable in Oxford Street Lush or on the Lush Kitchen (uk.lush.com/kitchen). These are limited edition so once they are gone, they are gone for good. I dont know about you but i’m pretty excited for Snow Fairy, imagine getting to smell like Snow Fairy all day long in a perfume form! 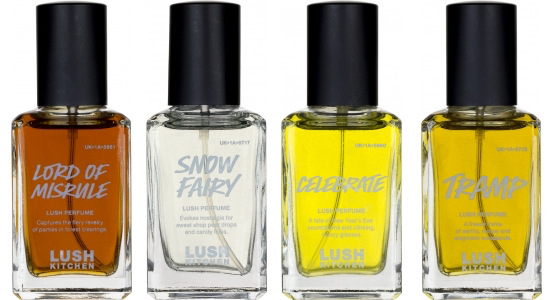 Snow Fairy (£25) includes notes of pear drops, candy floss and dolly mixtures. Celebrate (£28) contains a mixture of orange, lime and cognac oils. Lord of Misrule (£25) features scents of patchouli, vanilla and black pepper. Tramp (£28) is an earthy fragrance with notes of oakmoss and patchouli. Will you be getting Snow Fairy? Oh my gosh.. this is the perfect excuse for a trip to London! Totally go right now haha! I SO want Snow Fairy…!